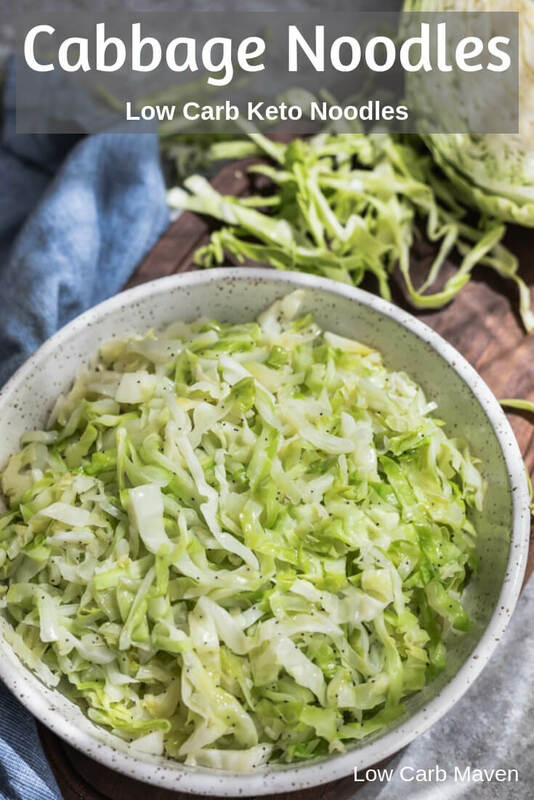 Buttery cabbage noodles are slightly sweet, low in carbs and calories, and the perfect low carb keto noodle substitute. 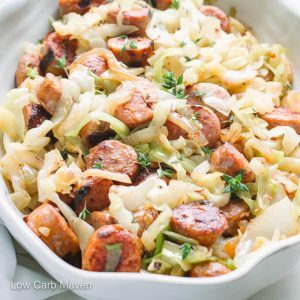 We’ve been eating a lot of cabbage lately – mostly in the form of keto coleslaw or cooked cabbage with sausage for an easy dinner. 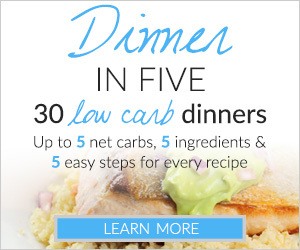 My kids love it, it’s cheap, it’s low in carbs, and super easy to cook. 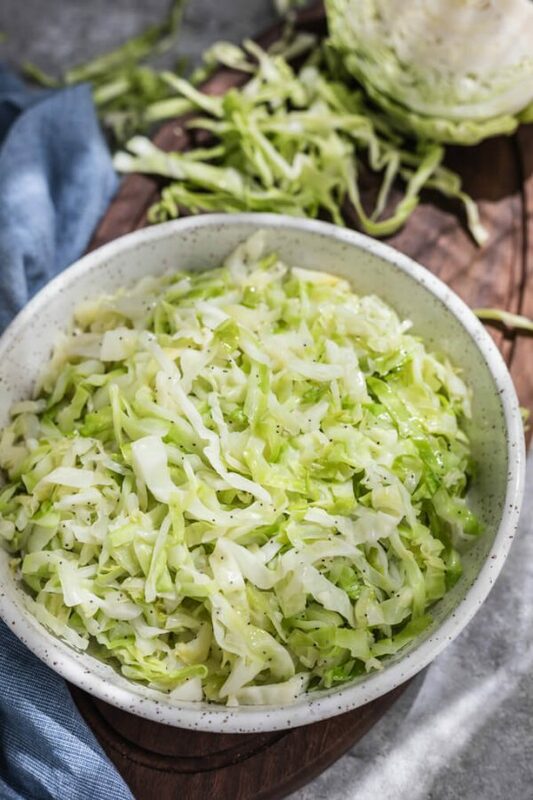 Believe it or not, cabbage is a versatile vegetable and great tasting, too! One thing that many people miss when starting a low carb or ketogenic diet are noodles and pasta. Noodles are great carriers for flavorful sauces and they fill us up in a satisfying way. 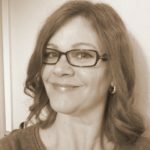 Finding noodle substitutes that we like can be challenging. Vegetable noodles, especially cabbage noodles, are some of my favorite low carb noodles. I have a vegetable spiralizer so we eat a lot of noodles made from zucchini, cucumber, or daikon radish. You can see some ideas on how to serve these low carb noodles in my Zucchini Noodle Shrimp Scampi, Coconut Basil Chicken, or Hearty Beef Curry recipes. Vegetable noodles can be served raw or cooked depending on the taste and texture you want. They can contribute extra moisture to a dish or get soft when overcooked so plan accordingly. 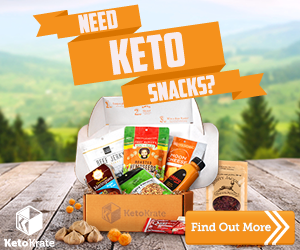 Noodles made from Konjac root are another popular low carb or keto noodle replacement. People either love them or hate them, finding fault with the initial smell or the chewy texture, which is similar to Asian cellophane noodles. I find they taste best when used with Asian flavors opposed to Italian flavors. 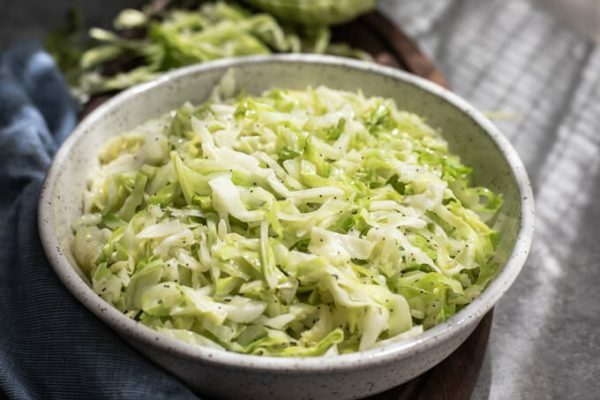 Cabbage noodles are cut strips of cabbage, that are cooked in a frying pan. The flavor is slightly sweet with a hint of bitterness characteristic of cruciferous vegetables. I use regular green cabbage with smooth leaves for cabbage noodles, but you could use any leafy cabbage you like. 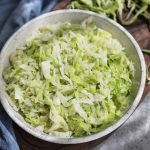 Cabbage is easy to cut into strips and cooks quickly in a hot pan. Cabbage noodles fill-out a plate making portions look huge. Add onions, garlic, bacon, green apple, vinegar, or sweetener to vary the flavor. Also, cut thin or thick to vary the look of the noodles. One of my favorite ways to use cabbage noodles is to top with low carb beef stroganoff or low carb sloppy Joe filling. They also make a great base for Pad Thai and other Asian dishes. Low carb keto cabbage noodles are always a family favorite. Cut the cabbage into quarters. Cut out the core and cut into strips. Thinly slice the onions and slice the garlic. Heat a pan over medium heat. When it is very hot, add the butter or oil and swirl to coat the pan. Add the cabbage, onion and garlic and saute until the cabbage is tender - about 10 minutes. 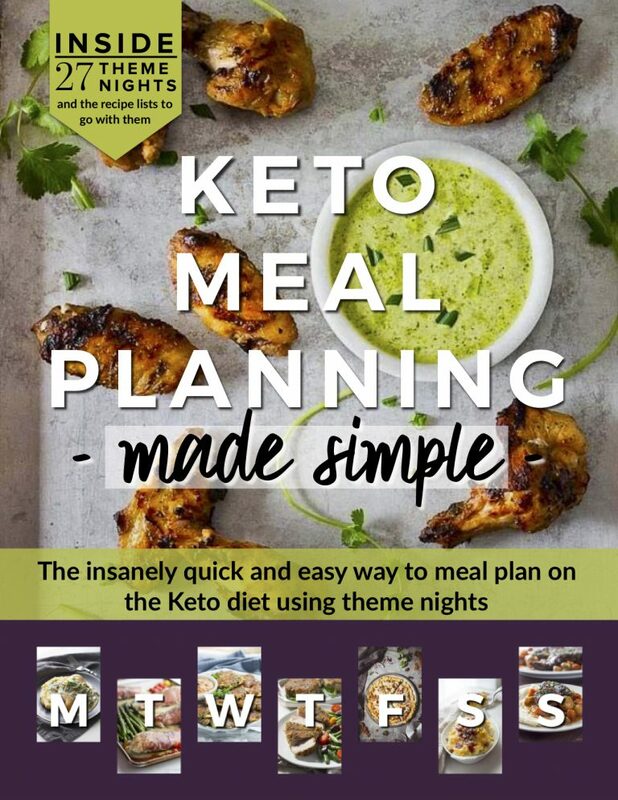 Serves 4 at 4.6 net carbs each. The cabbage and sausage dish looks so good. I it usually sauerkraut and potatoes.This recipe will be added to my favorite dish list. This is fried cabbage honey black folks especially Jamaicans have been making this for years. Oh I love cabbage!! It’s full of flavor and fiver!